A 13-year-old African American girl presents with acute right upper quadrant pain radiating to the shoulder. She had one episode of nonbloody, nonbilious emesis and is nauseated. She has no fever or diarrhea. On exam, she is afebrile, obese, and uncomfortable. She has tenderness in the right upper quadrant. Her direct bilirubin, GGT, and transaminase levels are elevated. The correct answer is “B.” Choledocholithiasis refers to gallstones in the common bile duct. Pain, or “biliary colic,” arises when a stone temporarily obstructs the biliary tree. Children and adolescents present with right upper quadrant pain, vomiting, and sometimes jaundice. The stone should be removed surgically. Stone removal by endoscopic retrograde cholangiopancreatography (ERCP) is becoming more common. Photo: Wells RG. 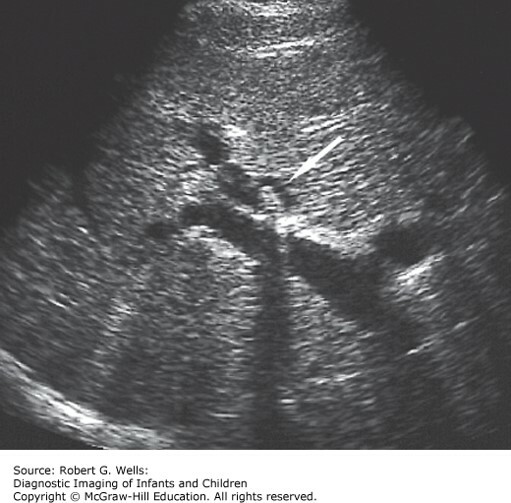 Diagnostic Imaging of Infants and Children; 2015.